Well, this is new! This week, the Paper Craft Crew has a SQUARE SKETCH CHALLENGE for you! Okay, it was a challenge for me too – because I always make ‘regular’ shaped cards. It may be square – but it’s still ‘hip’ to join our challenges! Just keep the square shape, and get creative with the rest! Okay – you also have to keep the general sketch, but you can flip it upside down or sideways. You can also change the focal shape – it doesn’t have to stay round. I can’t wait to see what you come up with! For this card, I used a stamp set that will be carrying over into the new Annual catalogue, called Lift Me Up. It also has coordinating Up & Away Thinlits, for die cutting some fabulous hot air balloons and clouds. Cut your Bermuda Bay cardstock card base to 8″ x 4″; score and fold in the middle at 4″. This gives you your 4″ square card. Next, cut a panel of Pool Party cardstock to 3 3/4″ x 3 3/4″. Stamp the spots image from Timeless Textures stamp set in Bermuda Bay and Calypso Coral ink. Add a strip of Designer Series Paper across the middle of the panel – I used some retired Sale-a-Bration DSP. On a separate piece of Whisper White cardstock, stamp the small balloon image from the Lift Me Up stamp set in Calypso Coral ink. Stamp it again on a Post-it Note, and cut it out with your Paper Snips, to create a mask. Lay the mask over the stamped image, then stamp the balloon again behind it, this time in Bermuda Bay ink. Stamp the sentiment in Calypso Coral ink on a strip of Whisper White, and use the Banner Triple Punch to create banner tails on the left end. Use the Big Shot with the Layering Circles Framelits to die cut the balloon images. Use the next larger size scalloped circle and a piece of Bermuda Bay cardstock to die cut a layer for behind the image. Now you can layer the circles together with Stampin’ Dimensionals, and tuck the sentiment banner in behind the image circles. If you’re looking for more inspiration, head over to the Paper Craft Crew challenge page, and see the amazing projects made by the rest of the Design Team! Then, when you’ve created your project, grab the link from there and link up – you could be our next Top Pick! 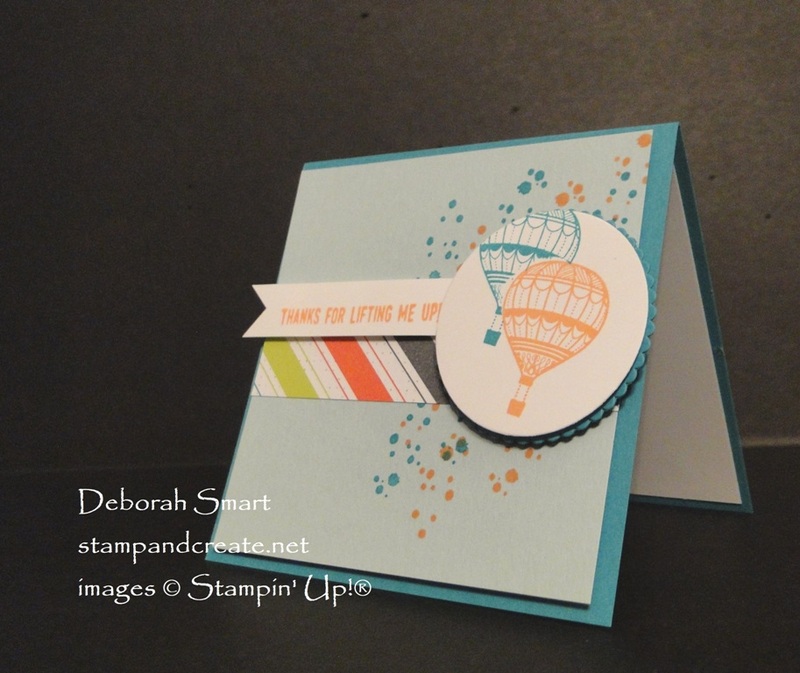 If you don’t already have a Stampin’ Up! demonstrator, you can order from me! Click on the product images below to order them from my online store. You can also browse around while you’re there. Remember that the Retiring Products are only available until May 31st – and they’re ‘while supplies last’! Luckily, everything I’ve used on my card will be carrying over. Previous Previous post: Get Your New In Colors Now! Next Next post: You’re Invited to My New Catalogue Kick Off Party! Great card, Deborah. It is a very hip square card (love how you said that!)! I love this card! I don’t do square cards often, but they do look really cool (and hip!). Now I need to dust off my Lift Me Up that I keep forgetting about.